Mitch Nelles was born in New York City in 1953 and grew up in New Jersey. It was during his senior year at Rutgers College that he was first introduced to the “magic” of photography. Mitch had completed all of his required course work for his undergraduate degree in Biological Sciences and signed up for a photography course, which had a print portfolio for a final exam. This class gave him his first (and only) experience in the conventional darkroom. Upon graduating from college, Mitch moved to Texas to pursue his Ph.D. in BioMedical Sciences and then to Massachusetts for his postdoctoral training. 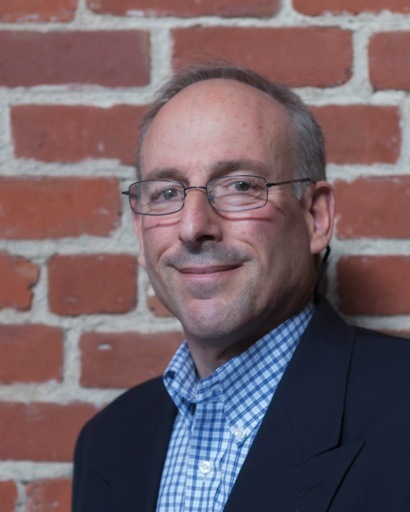 He moved back to New Jersey in 1986 and focused his attention to his growing family and job as a research scientist in the medical diagnostics field. Family and work during those years left little time for photography beyond documenting vacations and family events. Yet, as he entered middle age, he became acutely aware of his need for a creative outlet. Mitch was in his mid-forties when he made the decision to get back into photography. Content at first to have his film sent out for printing at a local photo lab, he missed the artistic control he remembered from his darkroom experience in college. Fortunately, during this period, digital image technology had become readily available and affordable for non-professionals. It became clear to Mitch that the digital darkroom was the way to go. Film scanners, inkjet printers, Photoshop, and digital SLRs provided him with all the tools and control needed to produce high quality prints that met his creative and artistic expectations. 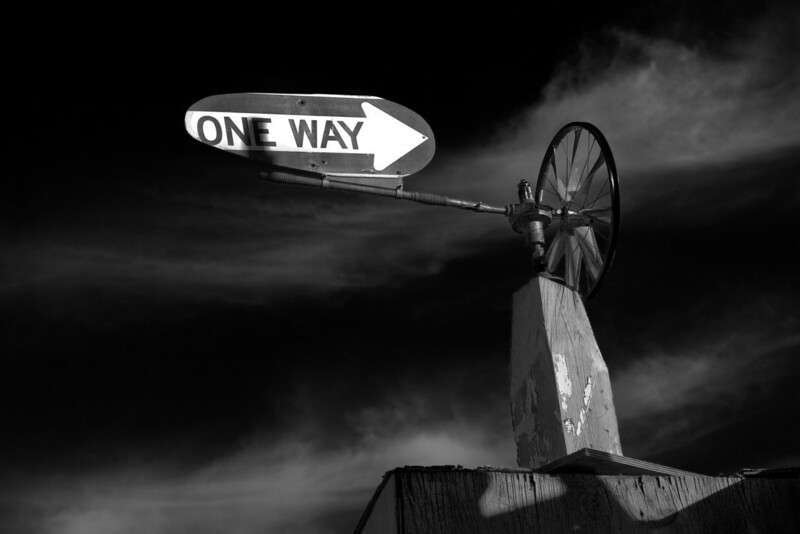 Following his move to Raleigh, North Carolina in 2001, Mitch joined the Capital City Camera Club where he met a group of like minded, supportive photographers who got together monthly to critique each other’s work and provide encouragement. He credits this small circle of friends with giving him the confidence in his photographic pursuits and helping him to see how different artists view the world photographically and express their individual creativity. Mitch is self-trained and credits a wide variety of contemporary photographers for helping to shape his photographic vision and literacy. Chip Forelli, Roman Loranc, Chris Honeysett, Clyde Butcher, William Neill, and David Fokos have had a significant impact on his approach to photography. Mitch works in the San Francisco bay area in the biotechnology field and lives in Half Moon Bay with his wife Janet. He has three daughters, Sara, Miriam, and Erica, who are the joys of his life. Now that he lives in California, he and Janet get a lot more visits from out of town family and friends. 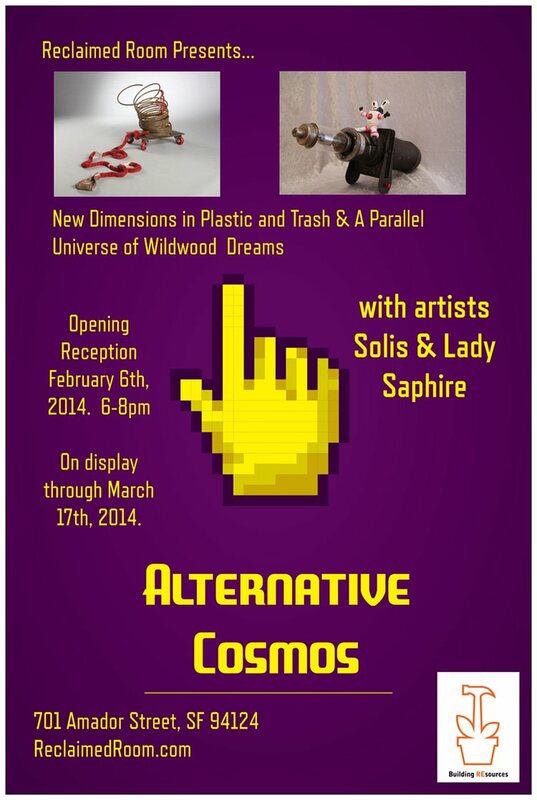 Join us Saturday January 17th for our newest exhibit and a departure from our previous shows. Impressions of the Bayview features Black and White photography at the center of the display complimented by abstract sculptures and unique temari works by artists: Mitch Nelles, Shantre Pinkney, Keith Wilson and Mariana Nelson. There is a also a surprise interactive element where patrons can take part in the art making themselves! Mitch presents a haunting view of our very own yard with photos of the Building Resources space through a lens that is nostalgic and reminiscent of past days. Shantre shares her ongoing project, Less We Forget, a portfolio of faces from the Bayview community in the vain of remembrance and not leaving things to the past. 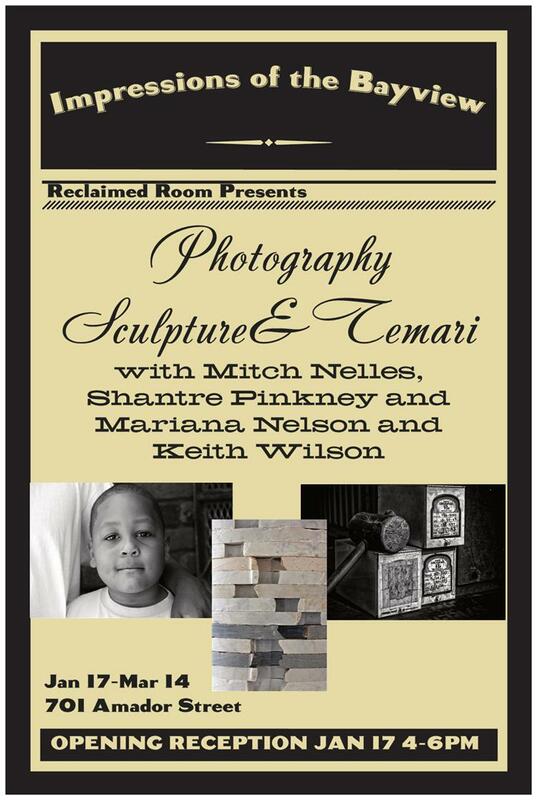 Keith reclaims old bathroom vanities and erects abstractly beautiful sculptures from them that seem almost other worldly, and Mariana shares her painstaking temari works, each piece crafted ball by ball and strung together to create a new vision, unusual and ephemeral. Meet and mingle with the artists and enjoy the gallery and the Building Resources space from a whole new perspective. 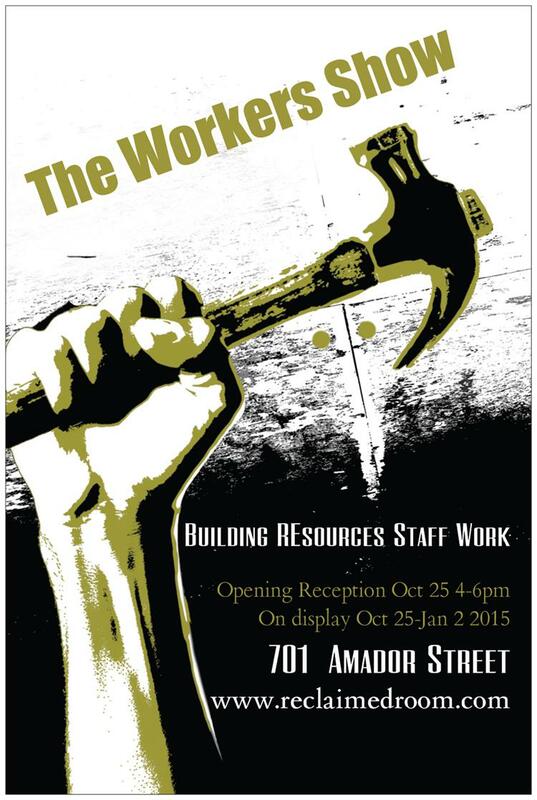 We welcome you to our new show and a new year at Reclaimed Room and Building REsources. JOIN US! 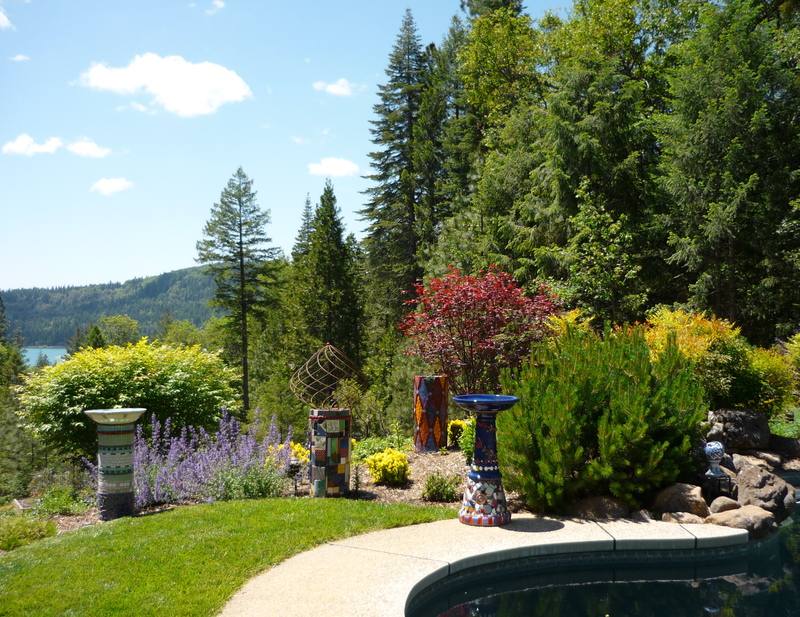 Martha Jones’ Discarded Satellite Dishes Mosaiced into Birdbaths and Garden Columns made from Terra Cotta Water Pipes and Salvaged Tile on display June 27. On JUNE 27th from 5-8pm, the Reclaimed Room opens its doors to the public with a reception for recycled artists Aleksandra Zee and Martha Jones with a unique light installation by Gregory Randolph Benke. Celebrate the inaugural event of this exciting new project by Building REsources. 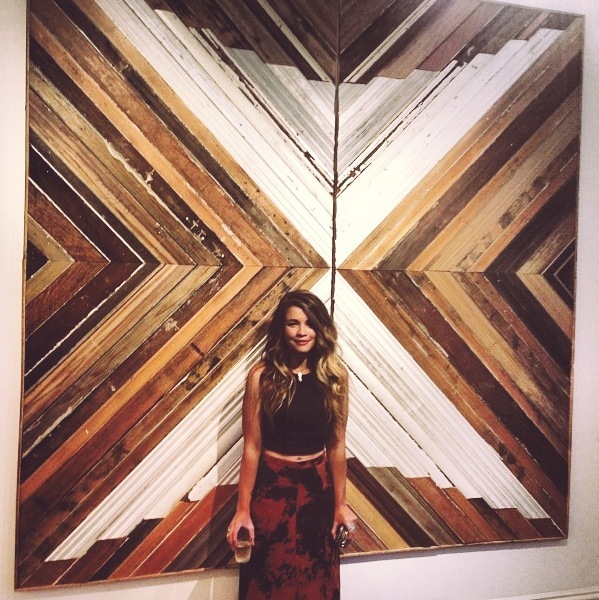 Aleksandra Zee creates three-dimensional objects from found and re-purposed materials, primarily reclaimed lumber. Ranging in scale from small interventions to whole room distortions, she strives to transform the viewer’s perception of the space. 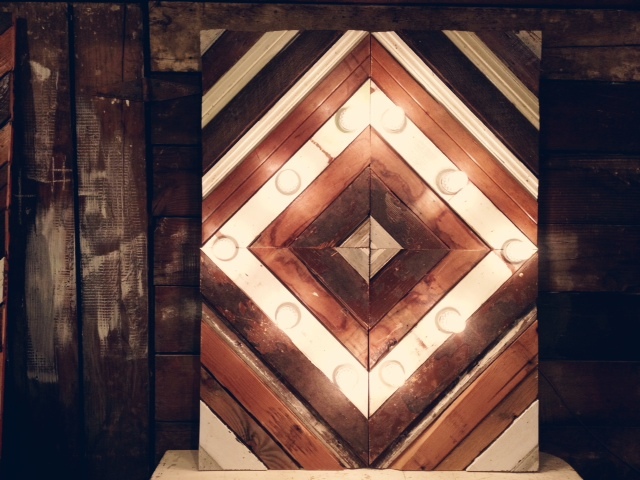 As a woodworker Zee creates anything from large scale wall hangings to furniture and tabletops. Zee is interested in the transcendance of the harsh, broken, or discarded materials into objects of soft whimsy. In much the same way, Zee wants the viewer to pause and lose themselves in the altered environment. Originally from Southern California, Zee is inspired by her travels and living and working in San Francisco. 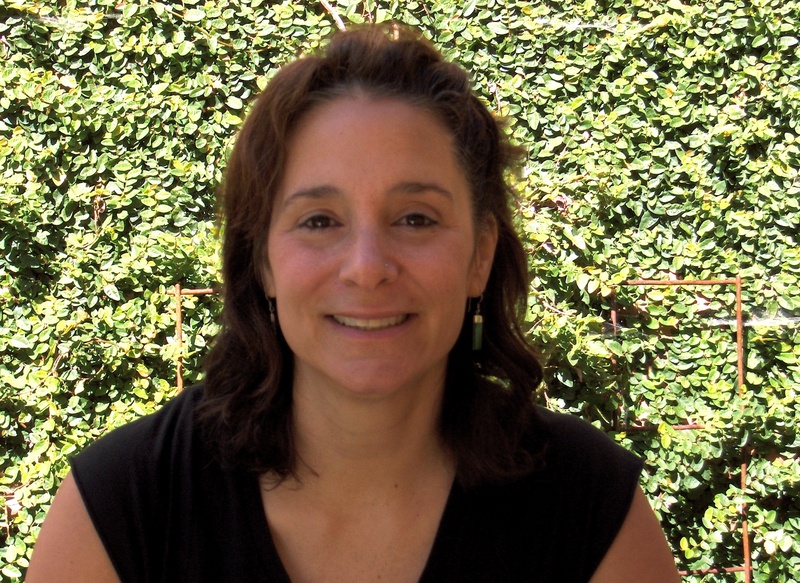 Martha Jones is a professionally trained interior & architectural designer, artist and owner of Green Mosaics. Jones combines her passion for design, salvaging and reuse into creating recycled art for home & garden. Intrigued by her mother’s Better Homes and Gardens magazines as a child, along with looking forward to local trash night, her unique art and approach blends her environmentally friendly attitude while also slowing down the amount of material put into landfills. 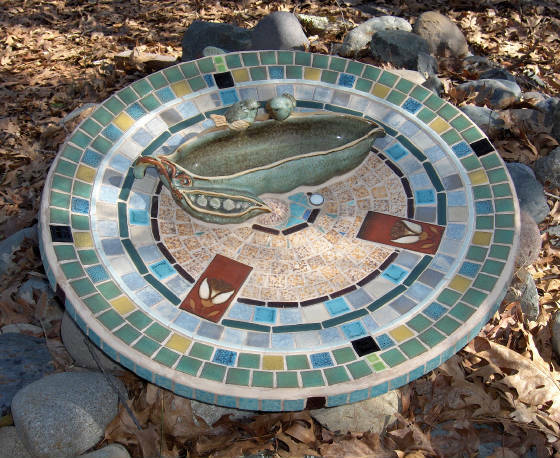 Birdbaths are created from discarded satellite dishes,terracotta chimney inserts are mosaic-ed into garden columns, table tops are made from leftover vinyl flooring, and junk mail, wallpaper and old calendars are used for collage picture frames and wall art.